I made this Buzz Lightyear birthday cake for my son's 4th birthday. It is a two layer cake baked in a 9x12 pan, iced with Wilton's buttercream frosting, and cut into a rocket shape. The template was simply a clip art rocket and Buzz face. After letting the cake cool completely, I put the layers together with buttercream as the filling. Then, I cut the cake into a rocket shape. I had problems with the cake crumbling, so try refrigerating the cake before cutting it. Then I used the crumb coating method of icing the cake. I iced the cake, put it in the refrigerator until the icing was hard, and put another layer of icing on top. To smooth the icing, I pressed a paper towel around the cake. I edged the cake using a star tip and lime green and orange icing. 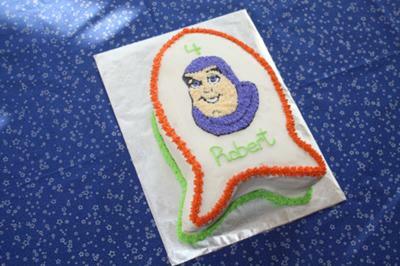 To make Buzz's face I traced my clip art template onto the cake using a toothpick,filled in the face beginning with the black outline, and then working my way in. Having a Buzz cake made my son very happy!